INS Deepak (Yard 6186), the first of the two Fleet Tankers being constructed by M/s Fincantieri Shipyard, Italy, was launched on February 12, at Muggiano. The double hulled tanker is expected to commence trials in April. 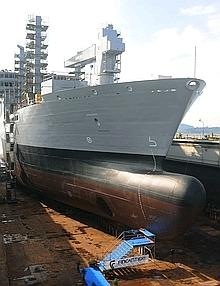 Commissioning of the vessel is scheduled in India by end 2010. The vessel was launched by Mrs Farida Khan, wife of the ambassador, His Excellency Shri Arif S. Khan, the Indian Ambassador in Rome. 175 metres long, 25 wide and 19 high. has a displacement at full load of 27,500 tonnes. has propulsion system powered by two 10,000 kW diesel engines, shaft with adjustable pitch propellers. can reach maximum speed of 20 knots. has a flight deck for medium weight helicopters (up to 10 tons). has maximum capacity of is 250 including crew and additional forces. equipped to refuel four vessels at the same time. 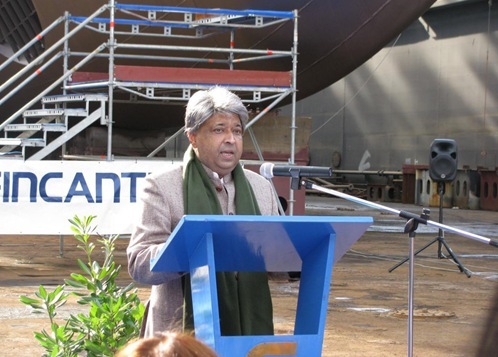 The Indian Ambassador Shri Arif S. Khan, chief guest addressing the gathering during the launch of fleet tanker INS Deepak, at Muggiano, Italy. Read more from press releases: Press Information Bureau and Fincantieri.